Celebrating the life of Eugene Gordon Peterson, Sr.
Obituary for Eugene Gordon Peterson, Sr.
LAKELAND – Eugene Gordon “Gene” Peterson, Sr., Master Sergeant, United States Air Force, 85, beloved Brother, Father, Grandfather, Great-grandfather, and Uncle, died peacefully at Lakeland Regional Hospital on January 26, 2019. 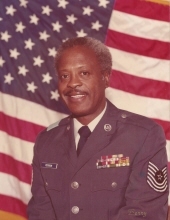 Master Sergeant Peterson was born in Titusville, FL, on February 9, 1933 to Abraham Frederick and Dorothy Pearl Peterson (nee Hawkins), and raised in Orlando where he graduated from Jones High School in 1952. Sergeant Peterson was an outstanding high school athlete earning several varsity letters on the baseball, basketball, and football teams. His love of sports continued into the Air Force where he was a tennis instructor, and played football, softball, and bowled, on many base teams. He also competed at the Air Force level on several softball and bowling teams. While attending Florida A & M University, he met his future wife Helen Delores Smith of Lakeland. He enlisted in the Air Force in 1955 and served honorably for 28 years, retiring in 1983. Following basic training, Master Sergeant Peterson qualified and served primarily as a Navigation Aids Equipment Technician. He also served as an Instructor of Basic and Advanced Electronics at Keesler AFB, MS, and as a Communications Programs/Requirements and Resource Management Superintendent for Headquarters, Air Weather Service. His service included assignments to Phalsbourg, France; Biloxi, MS; Tokyo, Japan; Tuy Hoa Air Base, Republic of Vietnam; Berlin, Germany; Osan, Republic of Korea; and Mascoutah, IL. His military decorations include the Bronze Star, Meritorious Service Medal, Air Force Commendation Medal, and the Vietnam Service Medal. Following retirement from the Air Force, Sergeant Peterson and his wife Helen moved to Lakeland, where he became a faithful member of Harmony Missionary Baptist Church. He is survived by his brother, Dr. Abraham F. Peterson, Jr., of Nashville, TN; sons, Eugene G. Peterson, Jr., (Lt Col, USAF, retired), Niceville, FL, and Brian F. Peterson, Lakeland; granddaughters, Dr. Evelena C. Cousin-Peterson, Brandon, FL, and Kiara P. Bridges (Brandon), Lakeland; grandsons, Frederick E. Peterson and Benjamin B. Peterson, of Fort Walton Beach, FL; great-granddaughter, Kindall C. Bridges, Lakeland; sisters-in-law, Betty S. Porter and Tereather B. White, of Lakeland; brothers-in-law, Richard L. Smith Jr. and Horace Bobby King, of Lakeland; nieces, Meroy P. Charles, Orlando, FL; Saundra Pearl Peterson and Becky Jo Peterson-Buie (Donald) of Greensboro, NC; Cheryl Peterson, Indianapolis, IN; and Denai P. Aardis (Reginald) and Jeannine P. Powell of Lakeland; nephews, Gordon L. Pledge (Jackie) and Roderick D. Pledge, of Orlando, and Abraham F. Peterson III, Daytona, FL; and many friends. Master Sergeant Peterson is preceded in death by his wife of 45 years, Helen Smith Peterson; his sister, Prudence P. Pledge, sister-in-law, Harriette A. Peterson, and niece, Matilda Williams Pledge. Visitation will be Saturday, 2 February, from 11 to 12 a.m. at Harmony Missionary Baptist Church, 1645 N. Webster Avenue in Lakeland. Services will follow immediately at 12:00 at the church. Oldham Funeral Home, Lakeland. To send flowers or a remembrance gift to the family of Eugene Gordon Peterson, Sr., please visit our Tribute Store. "Email Address" would like to share the life celebration of Eugene Gordon Peterson, Sr.. Click on the "link" to go to share a favorite memory or leave a condolence message for the family.